The E-30-IP VoIP Entry Phone is designed to provide quick and reliable handsfree communication for SIP VoIP phone systems with PoE. 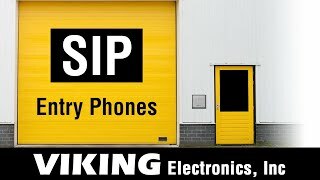 The E-30-IP entry phone can be programmed from any touch tone phone, a PC on the same LAN, or remotely using a static IP address. The E-30-IP can dial up to 5 programmable numbers. The E-30-IP entry phone will flash the “Call” LED during dialing and automatically light the LED when the call is answered. All programming parameters, including phone numbers and location numbers, are stored in non-volatile memory, requiring no batteries. This unit is PoE powered. For outdoor installations where the unit is exposed to precipitation or condensation, use model E-30-IP-EWP. For more information on Enhanced Weather Protection (EWP), see DOD 859.